The Castle (Kastro) or Fortress of Chios island (Frourion tis Chiou) is indisputably a unique ornament for the whole island. 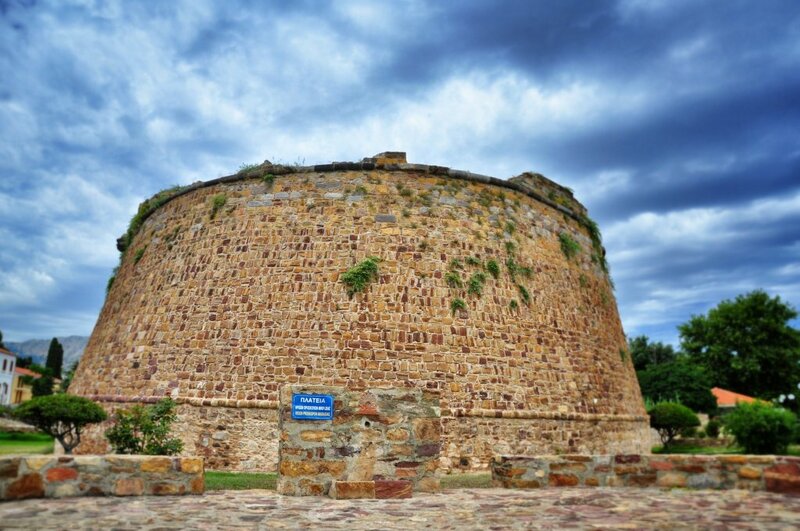 For this reason, this splendid monument invites visitors and locals alike to explore it. This brief introduction aims to provide essential information on the Castle’s history to all those who wish to discover its well hidden secrets. 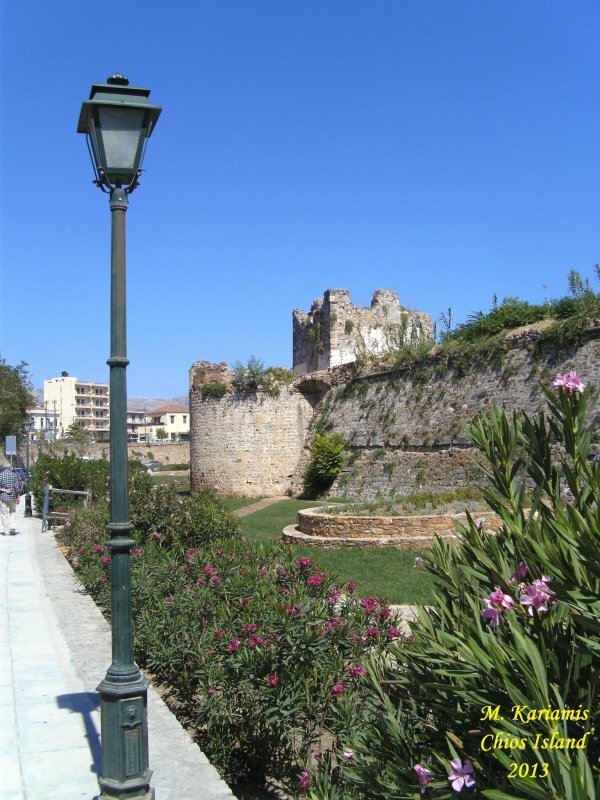 The area over which the Castle stands today has been inhabited since antiquity as it is testified by the earliest traces, which date from the Mycenaean period. 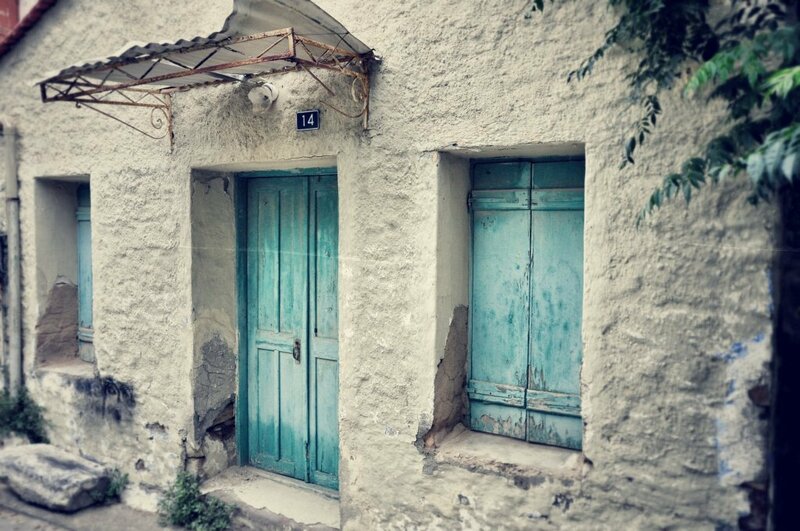 The town itself reserves a special place in the Homeric poetry, where it is mentioned as ‘Χίος τ’ έναλος πόλις Οινοπίωνος’, that is, when it was first established as ‘the coastal city of King Oenopion’. Archaeological excavations within the circuit of the Castle revealed antiquities, which date back to the Hellenistic era (end of 4th c. B.C. – 30 B.C). Ever since that time, the castle has been inhabited uninterruptedly despite the multiple attacks and invasions that ambitious conquerors afflicted to it throughout its long history. The uninterrupted sequence of habitation in the course of hundreds of centuries brought about constant changes in its plan, on account of different needs, expansion of the habitation area, etc. 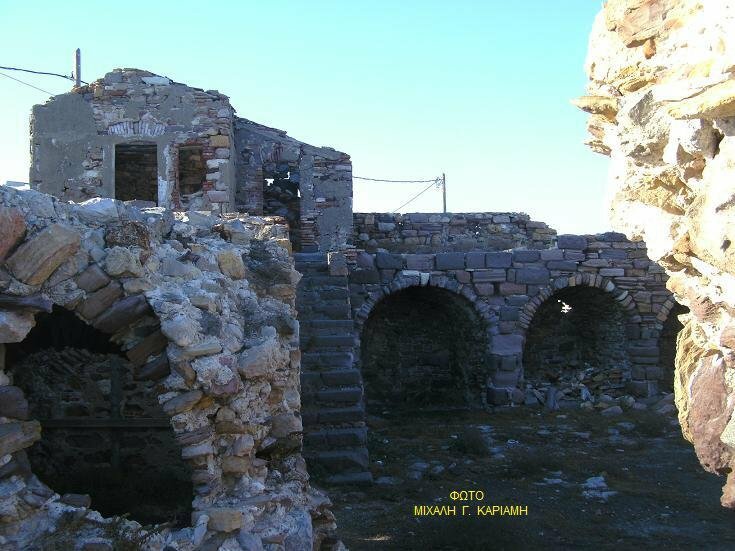 The present state of the Castle’s condition reflects a chronological sequence beginning in the mid-fourteenth century with the second Genoese occupation of Chios (1346-1566), following with the Ottoman conquest in the mid-sixteenth century (1566-1912) and the brief Venetian occupation of the end of the 17th century (1694-95) inclusive. 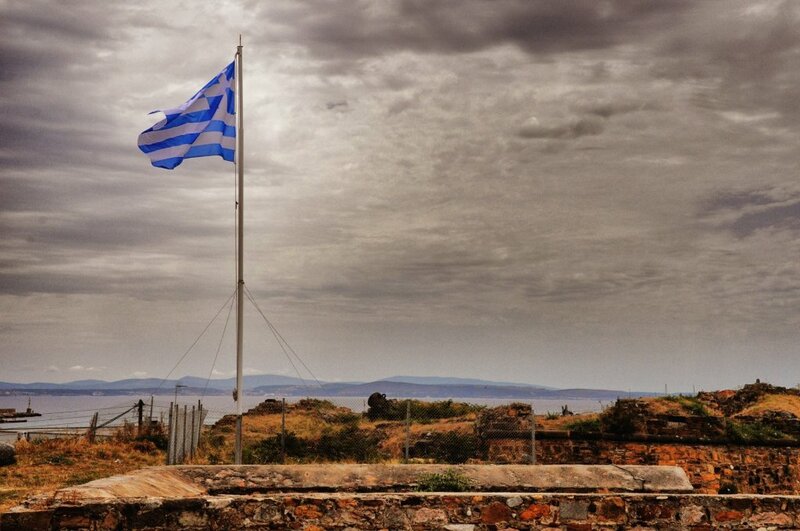 The Castle of Chios had always been the political, administrative and military centre of the island. Its most glorious era was certainly that of the two Genoese occupations (1304-1329, 1346-1566), during which the island experienced a long period of an unprecedented prosperity. For more than two centuries the island was the first port of the medieval and post-medieval world, weaving a huge commercial network, which brought together the eastern and western Mediterranean with northern Europe. The Castle enceinte (circuit walls) is distinguished between land- and sea-walls, which altogether form an irregular pentagon protected by strong towers built along its entire length. Eight of these towers – some of which stand almost intact – still defend proudly the Castle, undeniable witnesses of the former glory. The eastern section of the castle suffered heavy destruction in modern years, as a result of the construction of the new harbour. The damage, unfortunately, is irreversible. Incorporated in the masonry of the land wall and in one of its towers there are three marble slabs bearing the coat of arms of the Genoese family of Giustiniani, rulers of Chios from 1346 to 1566. The Giustiniani belonged to several noble Genoese lineages. Among them those who were ruling Chios decided to join forces in the administration of the island and for this reason established a commercial company named Maóna. They adopted a common name, namely Giustiniani, to facilitate their international commercial transactions. The Maona’s main task was to exploit and commercialise the agrarian produce, animal husbandry and natural resources of the island. 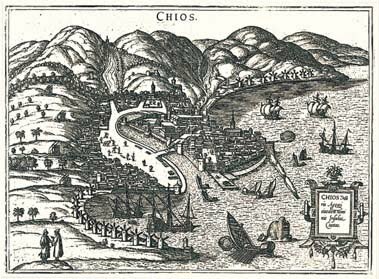 Under the Genoese, Chios became also a port of call and an entrepȏt for the international trade. A great variety of products from the East and the Black Sea markets were stored in Chios awaiting their transportation to the four points of the compass. 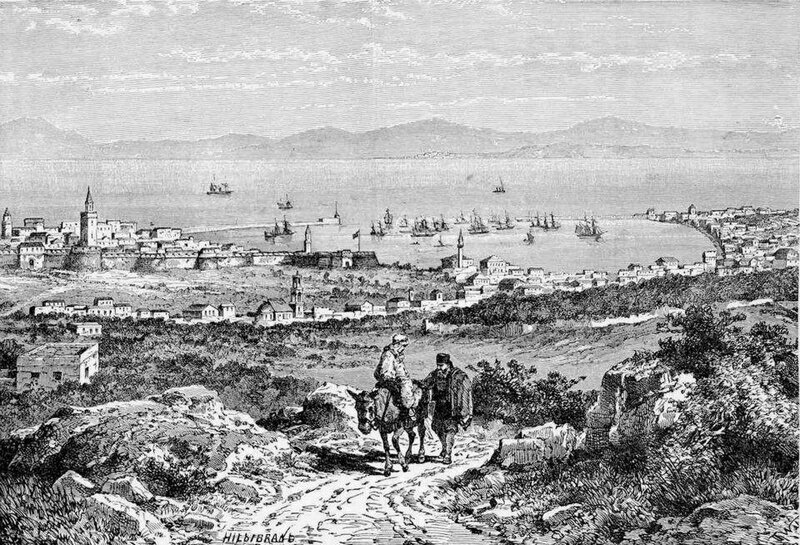 Under the Genoese rule, Chios was promoted as the first port of the Levant and a strong commercial centre. 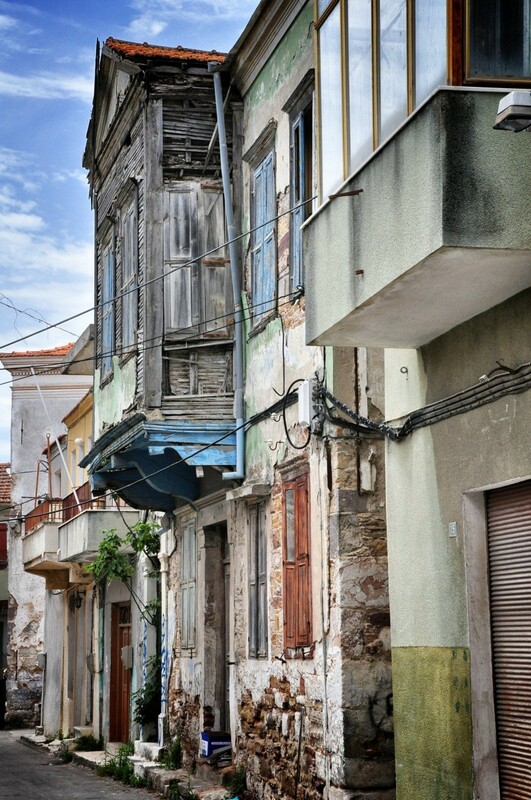 Its commercial role rendered the island a point of connection of all the major ports between the axis of the eastern and western Mediterranean, the Black Sea and northern Europe. 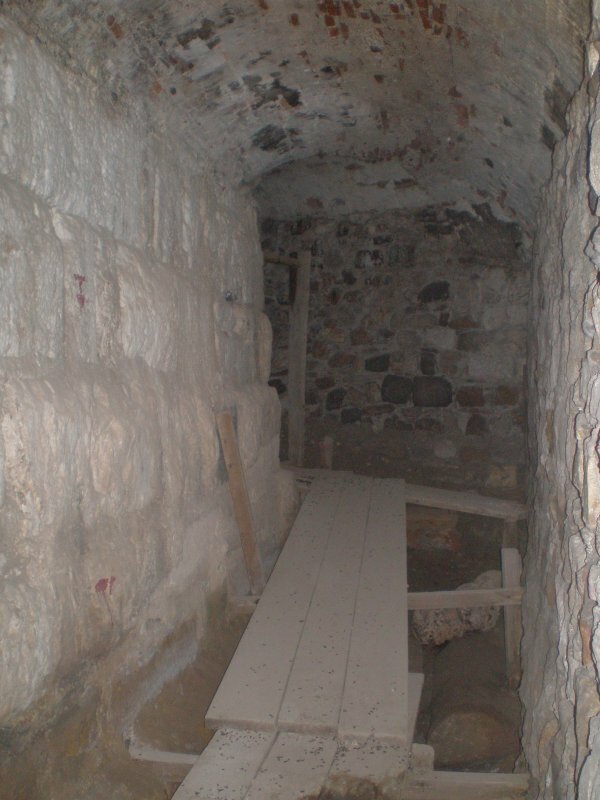 The interior of the walls is full of tunnels, lit by narrow and square embrasures for light and heavy weapons, respectively. The square embrasures were most suitable for cannons. 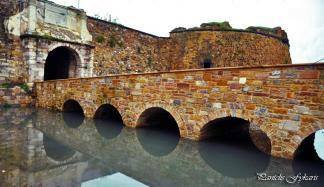 A deep moat filled with water surrounded the land walls, thus secluding the Castle from the areas outside the walls, the Burgo. It was an effective system of defence and protection against potential danger. Nowadays, the moat is a dry ditch, whereas the two stone bridges, that provided the means of contact with the walled town have been covered with soil; this took effect when Chios was united with Greece, because the authorities wanted to raise the level of the ditch and keep it above sea level. 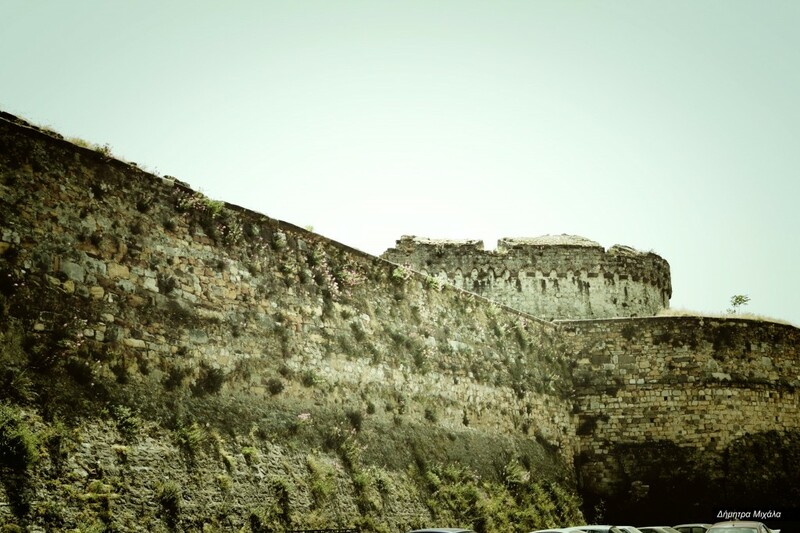 It is important to mention at this point that the Castle had three gates, namely: the main gate, the so-called Porta Maggiore, the western gate or ‘Epáno Portéllo’ (i.e. the ‘Upper Gate’), and the Sea gate, known as the Porta di Marina. The interior of the Castle is of high interest for the two following reasons: first, there is a live community of around 650 inhabitants, with uninterrupted, diachronic presence which goes back thousands of years ago; secondly, the Castle interior is a colourful mosaic, a palimpsest of monuments and buildings representative of different historical eras, which, in their turn, reveal hundreds of centuries of the castle’s history. 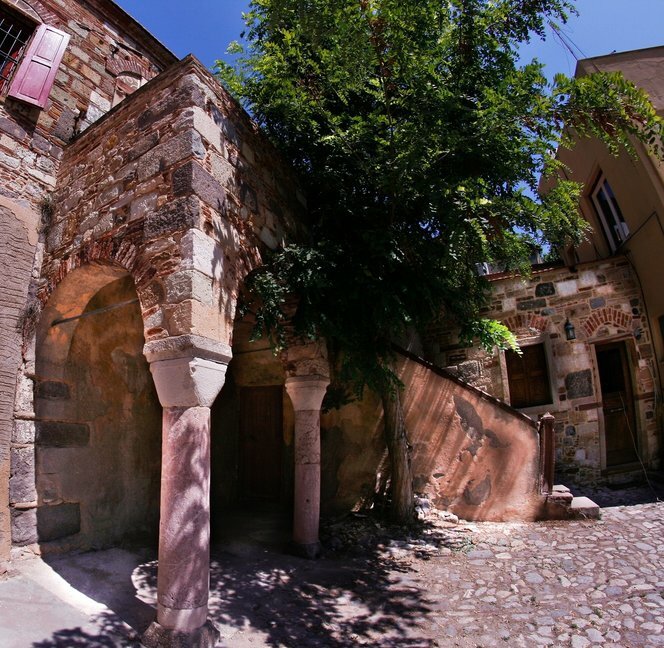 As soon as you walk through the Porta Maggiore, a snaky corridor leads you to the recently restored ‘Giustiniani Palace’ (Palataki Ioustiniani); as its name reveals, the building used to house the guard authorities of the Castle during the Genoese rule. Adjacent to the ‘Giustiniani Palace’ you can see the ‘Dark Dungeon’ (Skoteini Fulaki), a building where in 1822, seventy distinguished members of the Chiot nobility along with the Orthodox bishop were imprisoned following the island’s uprising against the Ottomans. 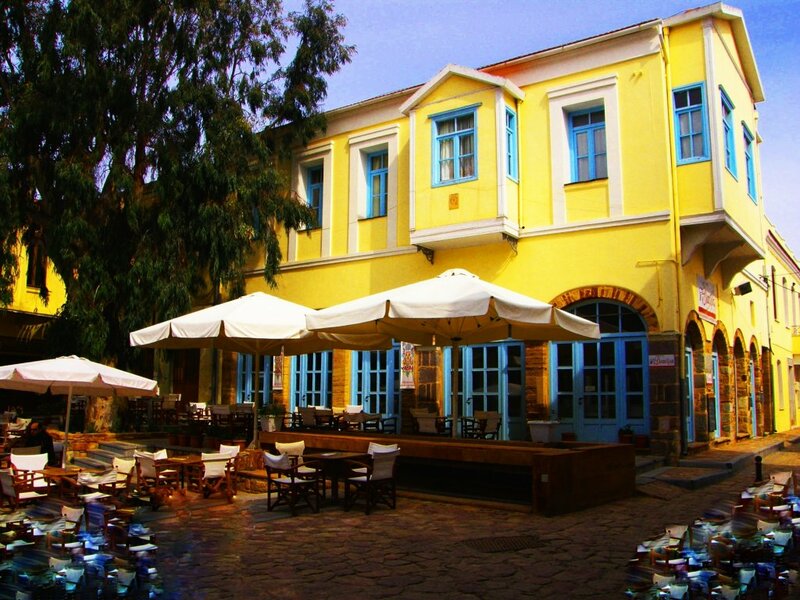 The nobles were kept here until they were transferred to the main town square, the Vounaki, where they were hung. Leaving the Giustiniani Palace and the Dark Dungeon behind it, a narrow pebbly path leads to the Castle Square, where you can see the Ottoman cemetery. The most outstanding and distinguished grave is that of Kará Alí Pashá, the admiral of the Ottoman fleet, whose juggernaut was blown up by Constantine Kanáris. Kanaris was a hero of the Greek revolution and later minister of Maritime affairs and Prime Minister of Greece. In June 1822 he set fire to the Ottoman galley as a response to the Turkish menace against the massacres of the population of his home-island in the spring of that year. 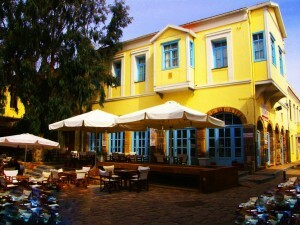 Last but not least, the Castle square also hosts the recently renovated two storey-building, the former ‘Apollo’ hotel. 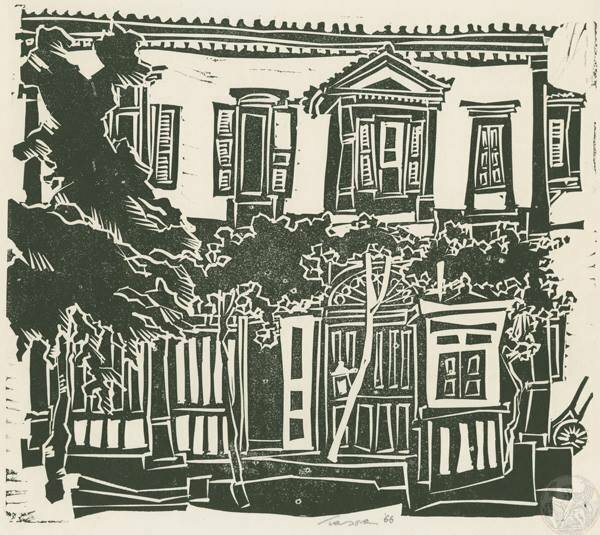 The main road of the walled town is St George Street; it cuts through the little and cosy neighbourhood, which underwent extensive rebuilding in the aftermath of the disastrous earthquake of 1881. 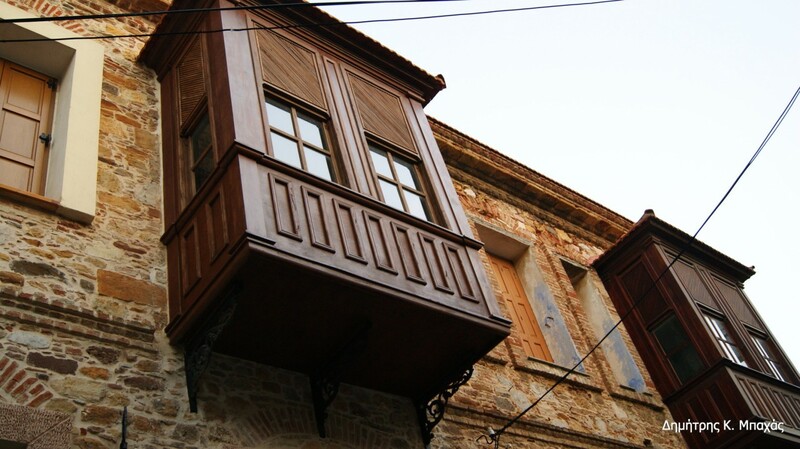 The neighbourhood layout has been rebuilt according to the local traditional architectural style, whose characteristics are the small yards, the alleys, and the two-storied houses with the Ottoman wooden closed balconies; the latter create a conservatory-like effect (the Kiosedes). You will also notice that the Castle area includes three churches, namely St George, St Nicholas and St George the Kehrí, with very interesting historical and architectural characteristics; the latter is a private chapel. St George is the main church, ‘the cathedral’, of the Castle. Archaeological excavations in its yard revealed that an older church pre-existed on the same spot during the Byzantine times; it was later taken by the Catholics who converted it into their rite, until, finally, it became a mosque during the Ottoman rule, the Eskí Camii. The edifice that we see today was originally built to be used as a mosque in the aftermath of the earthquake of 1881 A.D. 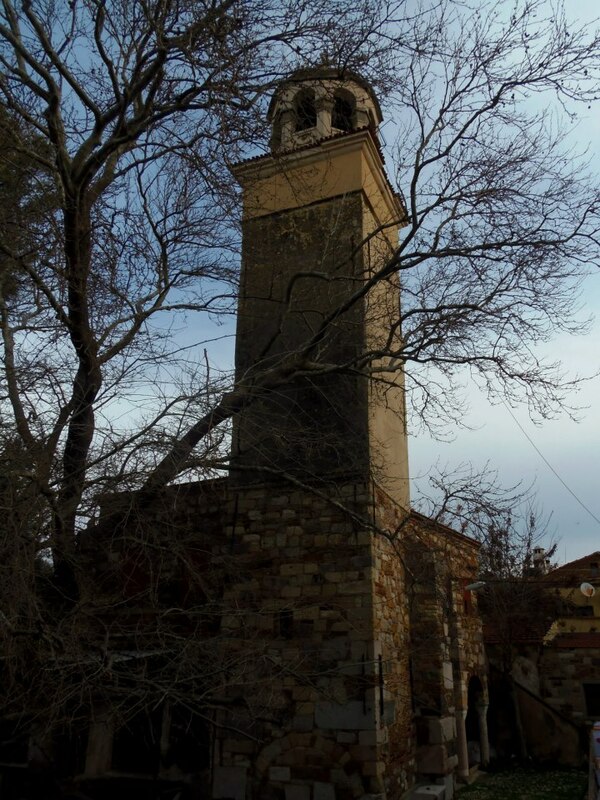 In 1912, after the liberation of Chios from the Ottomans it was converted into an Orthodox church without any major architectural changes. Take some time to stroll in the yard and you will certainly be impressed by the imposing plane tree and the marble sarcophagus, probably of a Genoese origin, which the Ottomans used as a fountain to wash their feet before entering to the then mosque. Immediately adjacent to the church of St George, you can see the Ottoman school for Muslim priests, the Mendresé. A few meters ahead you can see the ‘Bairaklı Camii’, which is now the only surviving mosque within the Castle area. 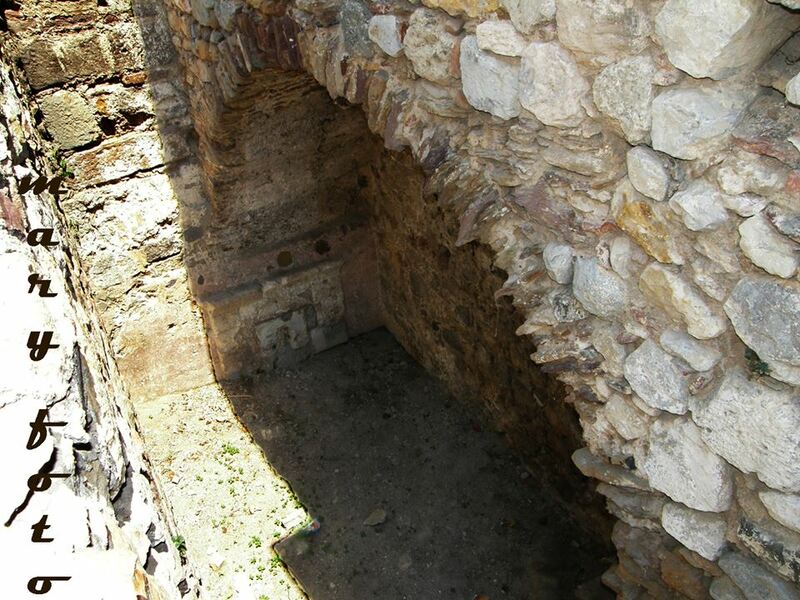 The water supply of the walled town was provided by a domed cistern through the fountain ‘Kría Vrísi’ (i.e. the Cold Tap). The cistern dates from the Byzantine period. Both the cistern and the fountain survive and you can see that they are constructed near the sea walls. 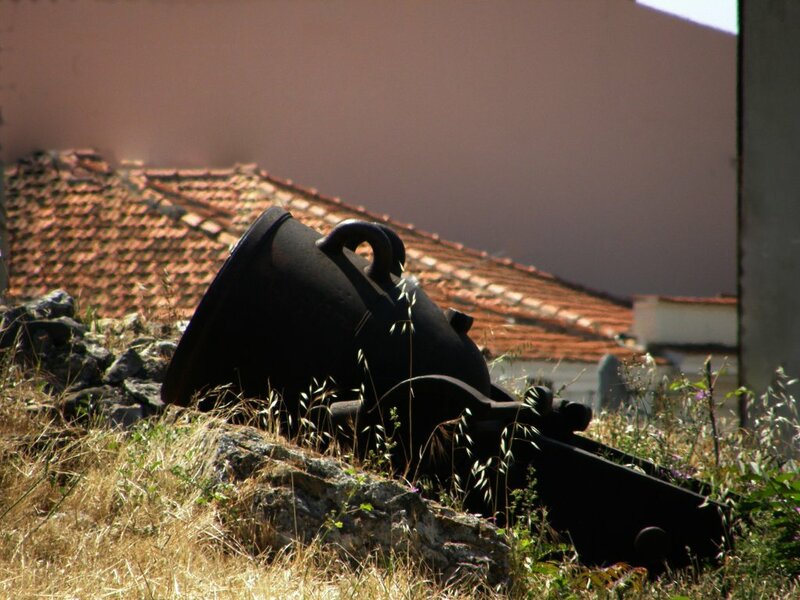 In the same area you can also see an oblong, spacious domed building, the so called ‘Karnáyio’ ( small shipyard) or Piritidapothiki: Gunpowder Warehouse, probably of a Genoese origin; surprisingly, its use is dubious. 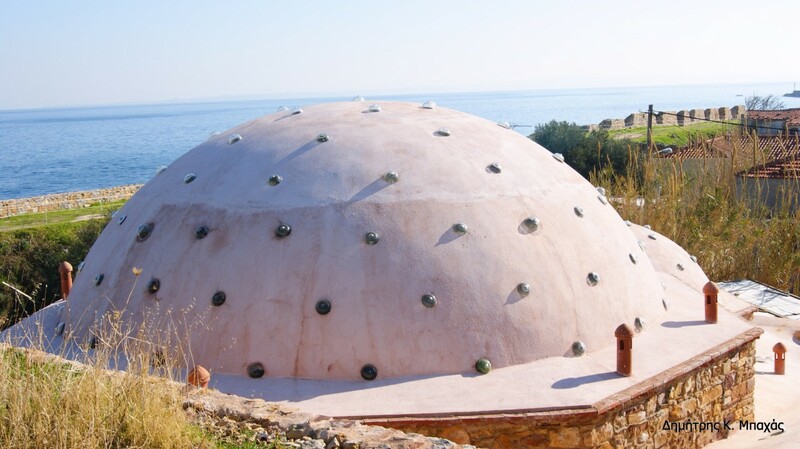 The Castle also houses two Ottoman baths (Hamáms); today the smaller one is a private property, whereas the larger has been recently restored and is used to host an array of cultural exhibitions. 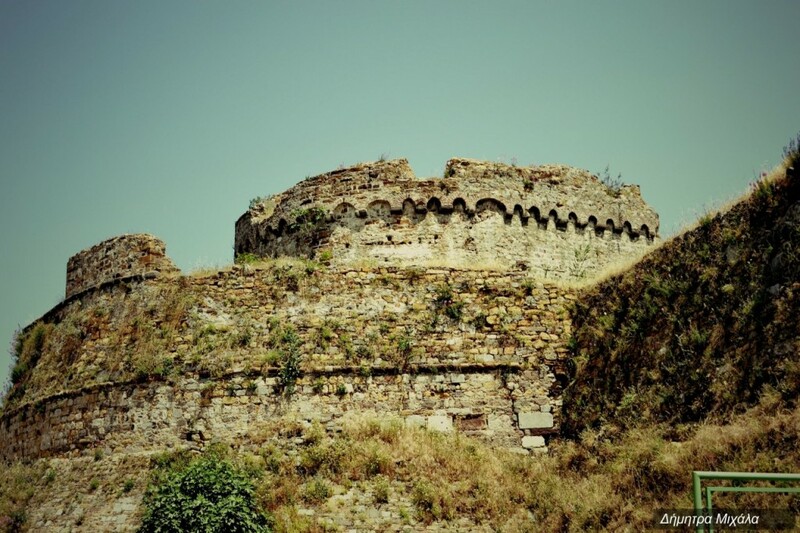 Finally, one of the most peculiar, however significant monuments of the Castle is the horse-shoe shaped tower, the ‘Koulás’, a structure of unknown date. The reason which renders it so important lies in the fact that it has been built from ancient ruins (spolia: architectural members, marble decorative elements, etc) dating to different historical eras. 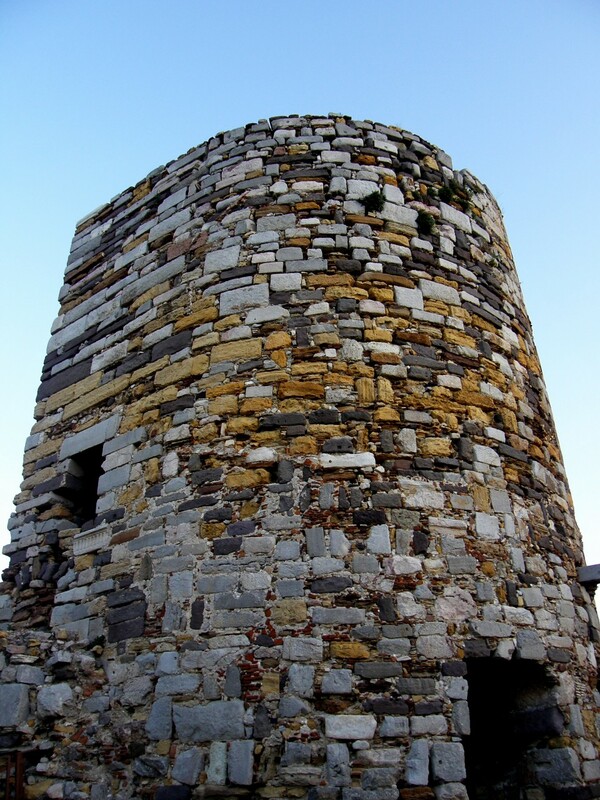 The most prevalent theory on its role, claims that the Koulas must have been the central beacon of an entire chain of watch-towers (the Vigles), spreading along the island’s coastline as well as across its hinterland. The Vigles were used as invigilating/observation points erected in such a manner so as to ensure visual contact to each other – (‘Vígla’- Vigilia or Βίγλα in Greek and Latin means ‘a place from where to invigilate’). In case of danger the warden signalled his colleagues by means of fire signals, and it took the alarm no longer than a few minutes to spread throughout the island. 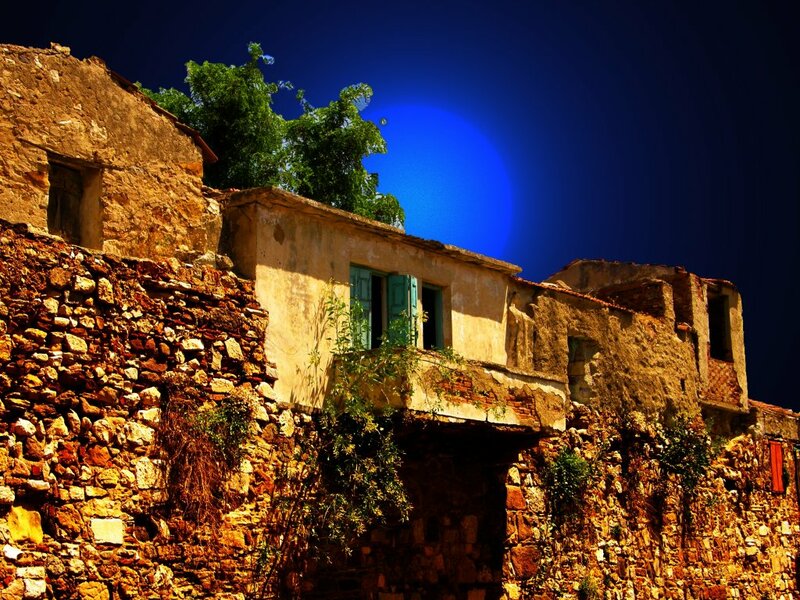 Having written that little about the Castle of Chios, there is no doubt that it gives you a fascinating tour through the ages. The permeating silence of its walls sound as a bird’s song praising the Castle’s history, while its alleys provide encounters with the souls of its past dwellers, those who sculpted its walls and edifices and shaped its very existence!!! Every single step is equivalent to a trip back into remote centuries, into remote times! What are you waiting for, then? 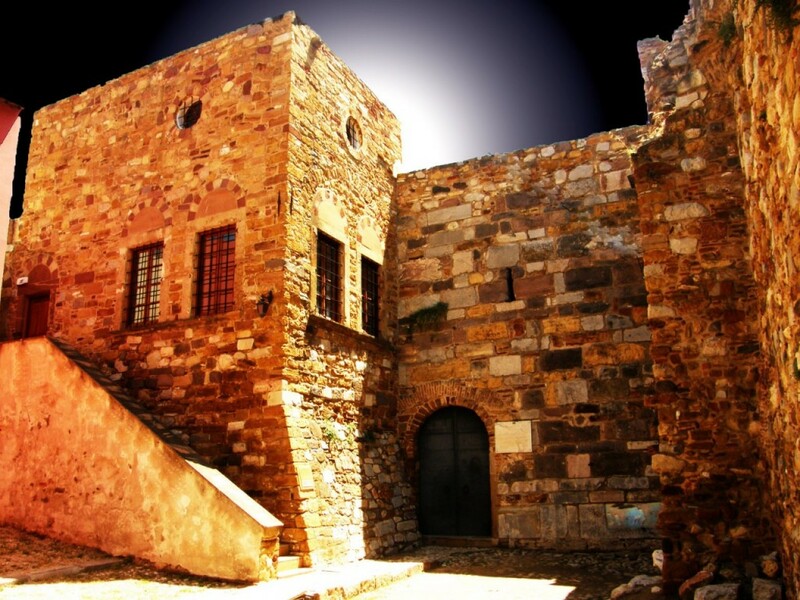 The Castle of Chios Island is here, and calls proudly for the most enchanting exploration!! !